Jim and partner Ken Westerfield won the very first freestyle title at the Canadian Open in 1974. Together they crafted their game by doing shows in Queens Park in Toronto then toured west toward Vancouver. By 1974 they had a sophisticated game by endless hours of shows and practice at Yonge Park in Toronto. 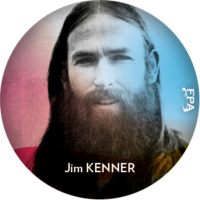 Jim went on the found Discraft and invented the most popular freestyle disc of all time, the Skystyler.